The wizards from Arctic Cat had a simple idea – create a lighter more efficient drive train for the transmission of power from belt to track. After much R&D, Arctic in 2004 released the now famous Diamond Drive on the venerable ZR 900. To date no other company has tried to build a better mousetrap in regards to efficiency, lightweight and easy to maintain powertrain, so credit Cat with that one. But there were problems and I will address those in short order. Arctic Cat Diamond Drive – Fact or Hype? So what is the Diamond Drive and how is it different? The Diamond Drive is a planetary gear set that replaces the standard chaincase and chain on a normal sled. Think of the moon and earth revolving around the Sun and you will get the idea of what a planetary gear set up is. Cool Huh? Why planetary? Why not just straight cut gears and be done with it? The key word here is variable and this is the secret to its success. The very nature of a planetary setup has lower overall gear ratios that can be employed to make take-off RPM much lower than a normal chaincase unit. Less horsepower is needed because of the lower engagement RPM as well as heat and belt slippage being reduced. So now we have longer belt life (theoretical) and lower engagement speeds. But what about midrange and top end? Midrange has better efficiency because of the “sweet spot” of the gear set installed and top end has exactly the same top out as a chaincase unit with the same overall ratio. So, no gains in top end and some gains in low and midrange. Changing the track on a DD sled is easier too because you don’t have to rip out both left and right sides of drive train like a normal chaincase sled. The Diamond Drive has moving parts that are lighter than chaincase equipped sleds as well. Straight cut gears would not work because of the noise factor and its characteristic one-to-one type gear ratio, so that option is out as well. Fast forward to 2011 and how has the Diamond Drive fared? Why haven’t other sled manufacturers adopted it? And was the internet hype true about a DD equipped sled being slower than its chaincase evil twin? Answers: Cat for 2012 has gone back to the standard chaincase and jackshaft type setup but with a twist. A twist you say? Yep, that’s right, there is a flat bar that goes from the jackshaft to the engine and locks right around the crankshaft flange. With the addition of a bearing in the chaincase side called a “high flex bearing” the engine can twist with the torque of acceleration but the engine belt and clutches stay perfectly aligned through-out the RPM range of the motor. Perfectly aligned belt to clutches equals maximum horsepower directly to the track. Simple, eh? And therein lies the Achilles heel of the Diamond Drive itself – the flexure of the DD versus the parallel plane of the engine. 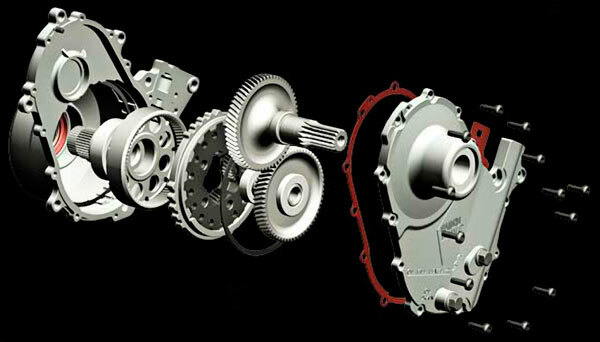 As most of you know, if the drive and driven clutches are out of alignment HP can be lost. It’s all about drive train efficiency and getting what you have to the track. Aftermarket companies such as Plowman and Supreme tool made engine mounts that would lock-in the engine so it was square with the clutches and thus solved that problem. As for the question of chaincase versus Diamond Drive speed wise I’ll let the racetrack tell the story. There is no shortage of drag race records that have been set using the Diamond Drive equipped sleds just look it up on the internet. ‘Nuff said about that. Just to clarify, Cat has retained the Diamond Drive on the touring models for MY 2012. See you on the trail!